Although there are several types of crowns, porcelain crowns (tooth colored) are the most popular, because they resemble your natural teeth. They are highly durable and will last many years. Porcelain crowns are made to match the shape, size, and color of your teeth giving you a natural, long-lasting beautiful smile. 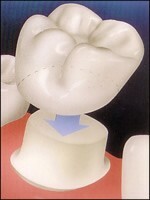 A crown procedure usually requires two appointments. Your first appointment will include taking several highly accurate digital scan impressions that will be used to create your custom crown. A mold will also be used to create a temporary crown which will stay on your tooth for a few weeks while your new crown is being fabricated by a dental laboratory.